Love guides all my relationships. All things are unfurling as they are supposed to. When I bring myself to grief but not wallow in it. In my sadness, I love myself. I will feel my grief but not wallow in it. I can find happiness in any situation. 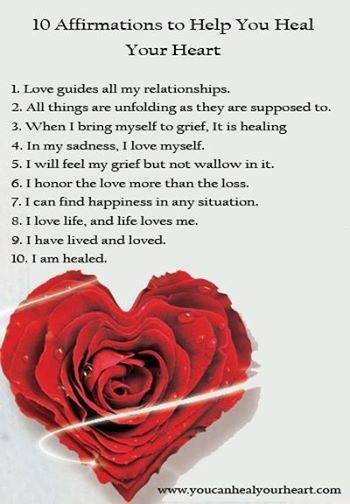 If you practice these affirmations and focus on love and loving yourself, your life will reflect more love every day. Although not every feeling is going to feel good, your feelings are an indication of what is going on in your life. So if you are feeling sad, let the feeling be and acknowledge it, then move on to another better feeling thought and better feelings as soon as possible. Honor your feelings and try to find out where the feelings come from without dwelling on negative feelings for too long. Because the law of attraction will bring you more of what ever you are dwelling on. Switch yourself to something that feels happy and watch more happy thoughts insert themselves into your life. After practicing these affirmations and seeking happy thoughts, more happiness will come to you. and know that your are healed.